Theo, Tom and Conor take a quick break in Sanders Preserve. In 2017, I started the Fire Tower challenge with my family as a way to expose my sons to the Adirondack and Catskill mountains, and bridge the gap between my experience and theirs. At the time it seemed like a great way to help give them a lifelong passion for the outdoors and exercise, expose them to age appropriate challenge, and give a positive reward for a job well done. The Fire Tower Challenge was exciting way to prep them for some of the more well-known hiking patches that come to mind in the Northeast including the ADK 46’ers, Catskill 3500 Club or New Hampshire 48. Luckily, they took quickly to hiking the mountains on the Fire Tower Challenge and I began to look for other challenges. One great resource I found was the Facebook Group, “Hiking for Patches.” This has a link that provides valuable resources on hiking patches in several states as well as international options. This alerted us to several newer challenges in upstate New York that were appealing. However, many of the hikes were a minimum of an hour drive. Then, last fall a release from the Environmental Clearinghouse of New York (ECOS) came out indicating that a new Seven Preserve Challenge had been created. Hikers who complete trips to the Bozen Kill Preserve, Christman Sanctuary, Indian Kill Nature Preserve, Lisha Kill Natural Area, Plotter Kill Preserve, Sanders Preserve, and Schenectady County Forest Preserve would be able to receive a patch. A review of our hiking and walks during the spring and summer showed that we had visited all but Sanders Preserve in Glenville. Hiking these preserves after work and in the morning had been a great way to keep everyone active, build fitness, and enjoy the outdoors. I made a note to plan a trip to Sanders Preserve the next opportunity we had so that the kids could earn their first hiking patch. Unfortunately, commitments piled up and I neglected going to the Sanders Preserve until this February. After the article on Indian Flats featured in the February 2019 issue (adksports.com), I received a message from an individual asking if I had heard about the ECOS Challenge. I responded that I had and thanked them for reminding me that I needed to finish the last hike on the list. Sanders Preserve – Visits to the first six preserves had raised our expectations for Sanders Preserve. Luckily it did not disappoint. Our visit coincided with President’s Day weekend and a fresh coating of snow. After exiting the car, we walked over to the trailhead to get situated. Surprisingly we heard the singing of birds from above and my son Conor noted he thought it was a black-capped chickadee. A quick look up and there was a whole flock of chickadees in the tree above. We referenced with “Birds of Sanders Preserve” sign and confirmed we had indeed spotted black-capped chickadees singing in the trees above the preserve mid-winter. Surprised, I double-checked with my phone and learned that male chickadees begin their songs in January and gradually build the duration and frequency of their songs for the remainder of winter. A popular 4.1-mile route at Sanders includes a 2.1-mile out-and-back, plus a two-mile loop. We completed the 2.1-mile out and back in about an hour. Sanders Preserve proves to be exceptionally educational if you take your time to look around. After learning of the different birds present at Sanders from the trailhead sign, we stopped at different trees that were marked with the names – paying particular attention to the sugar maple and shagbark hickory on this outing. The trip down the hill on the far side of the preserve pushed away much of the newer snow and exposed the ice below. We had to be careful on the return as this was the steepest and slipperiest part of the entire trip. The Boys explore a stone structure at Bozen Kill on a summer evening. After returning to the car I told them more about the ECOS Challenge. When we arrived back home, we printed the flyer for the patch (ecosny.org). Over hot chocolate and lunch, we discussed each of the preserves on the list. This was an important time to point out the importance of recordkeeping. I asked if they remember visiting each of the preserves. We could remember the seasons of several of the trips off the top of our heads, but the dates were not easy to remember. I told them I had been keeping track of our hikes in my running log, so I could use that as a reference. Bozen Kill Preserve – We completed Bozen Kill in August 2018. This is a shorter and relatively easy trail of approximately one-mile in the village of Altamont. Our visit was in the evening and we visited Bozen Kill after first going for a longer four-mile trip at nearby Winn Preserve. Both preserves are maintained by the Mohawk Hudson Land Conservancy, in partnership with the Nature Conservancy, and the Open Space Institute. On the date of our trip, members of the conservancy were performing trail maintenance. They had been clearing brush and long grass from the side of the trail and seemed to be preparing to clean up some downed trees. It was particularly muggy out and dusk was near so we cut it short due to the presence of mosquitoes. Before leaving the kids enjoyed playing lookout on top of a large stone structure. To learn more about the history behind Bozen Kill Preserve and conservation efforts visit MHLC (mohawkhudson.org). 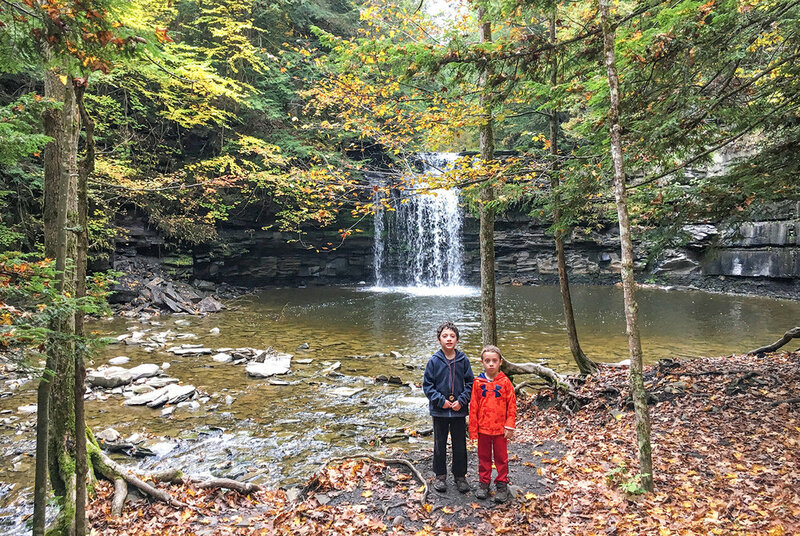 Conor and Theo enjoy exploring near the waterfall at Christman Sanctuary. Christman Sanctuary – Fall foliage greeted us when we hiked around Christman Sanctuary in October 2018. There are three primary trails – Blue, Yellow and Orange. We enjoyed exploring the blue and yellow trails and completed a 1.2-mile circuit of the preserve. When we headed over to the orange trail, we were met by a full Bozen Kill. There were few free rocks that were suitable to step on. Ones that were available had a coating of slippery moss. It became apparent that crossing over to the orange trail would require us to get wet. We opted not to add the extra mile loop on the orange trail. Highlights of Christman Sanctuary included a lean-to and waterfall. On several trips we’ve tried to be cognizant of the different tree species in each of the preserves. It can be fun to identify the trees by bark and leaf patterns. Because we were paying attention to the colors of the foliage, we overlooked the locust, cedar, spruce, and pine present in favor of the changing colors on the maples and other leaved trees. Visiting the Nature Conservancy (nature.org) will give you a detailed background of the Christman Sanctuary and tips on planning your trip. Water running steadily at the Indian Kill Preserve. Indian Kill Nature Preserve – Our visit to Indian Kill Preserve was a fun trip highlighted in the February 2019 issue. Indian Kill is maintained by Schenectady County (schenectadycounty.com). Lisha Kill Nature Preserve – The weather was nice for our visit to Lisha Kill Nature Preserve in April 2018. There was still snow present but much of it was melting. The trail was muddy, wet and slippery. Nice weather also attracted several other small groups and this was one of the busiest outings we had at any of the preserves on the ECOS Challenge list, besides Plotter Kill. I had done my homework prior to going to Lisha Kill Preserve and was prepared to pepper the kids with questions about the surroundings. I have to admit that I was surprised by this preserve. I was not expecting much as it seemed hard to believe so much could fit into such a compact area in between developments. We completed a 2.3-mile loop and were impressed by the deep ravines which added 331 feet of elevation gain to the walk. The nature conservancy points out that some of the white pine and eastern hemlock at Lisha Kill are estimated to be over 200 years old. I asked the kids how it felt to be surrounded by trees that have potentially been around since the last of the founding fathers of the US were alive. This served as a memorable piece of the trip. Lisha Kills is maintained by the Nature Conservancy. Conor and Theo enjoying a break on a bridge at Lisha Kill Preserve. Enjoying a great falls view at Plotter Kill Preserve on a summer day. Plotter Kill Preserve – When we visited Plotter Kill Preserve on a weekend in May 2018 we stayed in the southwestern area of the preserve. We were still able to complete a three-mile hike and 620 feet of elevation gain that includes two loops that allowed us to get very good views of the waterfall. The first loop included the well-marked Blue Loop trail. The second section requires crossing the Plotter Kill and taking the Highland Loop trail. The Highland trail was exceptionally wet and muddy during our visit and was not as well marked as it could have been. We took a few mistaken detours and then backtracked onto the correct trial. The kids enjoyed the opportunity to get dirty in this part as their boots sunk into the mud and water. Good places to stop and view the upper and lower waterfalls are present on the Blue Loop trail. An overlook on the north side of the Blue Loop offers a great vantage point for viewing the lower falls. Those wishing to hike longer can complete the whole preserve by connecting to the South Rim trail, which offers approximately seven miles of walking without overlapping on previously covered trails. The 3.5-mile distance to the Mohawk River drops 900 feet. We opted to save the trip to the farther Rynex Creek Falls for a later trip. We arrived back at the car hungry so it was a unanimous decision to stop for pizza and ice cream at a nearby plaza. It was particularly hot outside so the ice cream hit the spot! The Plotter Kill Preserve is maintained by Schenectady County. Peering through the trees to the fog covering the pond at Schenectady County Forest Preserve. Schenectady County Forest Preserve – Columbus Day was a busy day spent outdoors for us in 2018. Our trip to Schenectady County Forest Preserve came after visiting the Christman Sanctuary. The preserves are both located in Delanson, about 15 minutes apart, in the southwestern part of the county. It was muggy and a bit overcast by the time we arrived. A light fog greeted us at the entrance to the trail. While foreboding, it made for a great picture! Our trip around the preserve was approximately 1.7 miles and the foliage here was just as good as at Christman Sanctuary. The trail we took could easily be turned into a figure-eight for added distance. The ECOS Seven Preserve Challenge is a great way to inspire Capital Region residents to stay active and explore the wilderness in our area. The efforts by each agency involved in the upkeep of each preserve was evident, and the educational touches at several exceeded our expectations! The surprise opportunity to earn a hiking patch will also hopefully will help my kids understand the grit needed to complete some of the longer outdoor challenges listed at the beginning of the article. It would not surprise me if this challenge did the same for others who are looking to be active and build a fitness base! Tom O’Grady, PhD, MPH (thomas.james.ogrady@gmail.com) of Slingerlands is an avid runner, hiker and lover of the outdoors. He is an epidemiologist with NYS Dept. of Health. With a lifetime of racing experience, Tom has his NYS Dept. of Education coaching license, and is USA Track & Field Level 1 and Jack Daniels certified to coach distance runners and endurance athletes.